There is no reason for any central bank to shrink their balance sheet when they decide to stop QE operations. They can let interest bearing instruments roll off in time as they expire. They can hold on to stocks for investments. The total purchase amount is inclusive of reinvesting maturing debt. The balance sheet contains about 8 years worth of annualized bond purchases,. The balance sheet may just hold steady. Federal reserve has a balance sheet of 2 trillion homeless mortgages built against excess reserves and could have worked them off within the last dozen years? And clearly has a custody problem of significant size? The fed needs to do the twist again like they did 2012? Need to get excess reserves out of the system at whatever cost? Look, they’re not going to unwind in one month all of a sudden what they created over many years. They’re going to take is easy for a while. The Fed’s pace is doubling in January to $20 billion a month. And it will accelerate for the rest for the rest of the year. But it will still take a while to make a big dent into the pile of assets it has. Since QE didn’t cause major consumer price inflation, its unwind will unlikely cause consumer price deflation. But it caused asset price inflation, and when it gets unwound enough, you can expect some asset price deflation. QE-to-Infinity has caused dangerously unsustainable asset bubbles and reckless speculation, with the gains flowing to a tiny percentage of the population as the real economy stagnates. With the built in 20% plus earnings increases for the year 2018 built into corporate earnings due to the new tax bill, the SP500 seems to be on a mission to get to 3000 or higher as soon as possible. 3000 or bust. 1) The Fed loaned out mortgage refinance money to home owners at artificially low rates and, in doing so, gave the average home owner hundreds of dollars a month – money for nothing. 2) The inflated the value of homes and other assets owned by middle Americans. People who were not in position (millenniels) to buy houses and other assets are left footing the bill – they are basically indentured servants in Bernanke’s little free lunch scheme. The official dual mandate of the US Federal reserve: Maintain price stability and promote full employment. The dual mandate of the Federal Reserve in practice: Maintain wage rate stability and promote high and increasing asset prices. Not sure I follow this logic. You could also argue that only QE staved off massive deflation, which I think was Bernanke’s explanation for doing it. If an unprecedented stimulus fails to cause inflation, doesn’t this tend to prove at least an equal deflationary force. Second: the ‘wealth effect’ of record stock prices and near- record real estate prices must surely affect consumer spending on non-asset items that make up the CPI. Given the amount that has been borrowed against assets, I think a hard landing for stocks and RE, absent a return to QE, is arguably likely to cause consumer price deflation. You mean higher asset prices aren’t consumer inflation?? including stocks which working people have to buy through their pension fund, 401K. There has been plenty of consumer inflation, low interest rates don’t alter the liability assumed for a mortgage on the inflated value of a home, when the value of that home reverts to the mean. A low fixed rate mortgage is no guarantee that the terms can’t be reset if the lender sells the paper under duress to another lender, the law states the new lender can call the loan, or reset the mortgage. Because it never happened in 2008 doesn’t mean it won’t happen. So the asset price bubble is a very interesting source of consumer inflation and deflation. The only recourse in bubble two is to print real money and cause the CPI and cost of living to match the gains in assets, but yes consumers buy assets too. At the present, Japan’s schedule is continuing with 6-9 trillion yen purchases a month in JGBs. There are studies that show that 40 percent of the income for the top 10 percent come from realized gains on investments. The group accounts for nearly 50 percent of consumer expenditures. 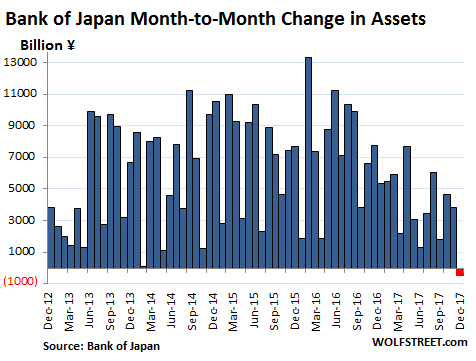 And the BOJ’s overall balance sheet has shrunk in December for the first time since Abenomics became the economic law of the land (late 2012). Nothing is reversing, markets are more liquid then ever. The central banks have soaked the globe in a biblical flood of currency. People everywhere, who own homes (or any asset) are flush with cash. My sister, who sorts mail for $10/hour, recently checked the “zestimate” on her modest house – it’s apparently worth $700K (it was purchased for $80K) – time to pull out equity!!!!! Everyone drives expensive new vehicles, Christmas spending shattered old records, expensive smart phones are flying of the shelves… Happy Days are Here Again!!! Americans are living large and making money through hard work is for suckers – hard work is just not the American way (anymore). Speculate, speculate, speculate – everyone’s a winner!!!! 70% of Americans are swimming in cash from the asset bubble created by the central banks. The 30% that were not in position to speculate or own a home are screwed (sorry millennials) as they are left having to pay inflated prices for everything. One thing is certain: if asset prices ever start to deflate the world’s central banks will continue zirp, nirp, QE and QQE on an even bigger scale. Central banks will never allow housing prices to crash again – the money printing will continue (it has to continue). Millions of people who own homes in rural America are not “flush with cash.” They are barely holding their own. People here in rural Massachusetts depend on their paychecks to survive, not borrowing against old homes on 1-10 acre properties that would sell for $150,000 if you could get a buyer. And the paychecks are hard to come by, unless you want to work at Walmart, a grocery store, or as a home healthcare worker, or a gardener, maid, or maintenance person at a resort hotel for $11-15 dollars an hour. I wonder if Friedman will be proven right. “Generally, the initial effect [of a change in the quantity of money] is not on income at all, but on the prices of existing assets, bonds, equities, houses, and other physical capital.” But ” the effect spreads from one asset to another”. I think that this is very interesting, and its relevance today is surprising. It’s been totally debunked by 9 years of massive liquidity infusions. Friedman’s model was based on the money flowing freely through the economy, not being boxed up in “assets” or whisked away to the Cayman Islands or Jersey. Since Friedman wanted to pretend, for ideological reasons, that money did NOT confer power on those who had it versus those who did not, he couldn’t foresee that $22 trillion in new liquidity would wind up in the hands of less than .1% of the global population because they insisted on that result and got it. Freidman, like all economists, had models with very limited applicability. One of their favorite introductions is: “imagine economic entity A and economic entity B on a desert island…”; the desert island minimizes complex feedbacks and side-effects. Generally, Freidman was correct. However, I don’t think ANY of the economists (INCLUDING FED CHAIRS!) predicted what would happen with QE- where you money that “never gets to M1”- e.g. it’s “money inside the banking system only”. It will indeed take a while…presently, aren’t we at the equivalent of “rounding” a decimal on a financial statement? If the American people ever allow private banks to control the issue of their currency, first by inflation, then by deflation, the banks and corporations that will grow up around them will deprive the people of all property until their children wake up homeless on the continent their Fathers conquered…. I believe that banking institutions are more dangerous to our liberties than standing armies…. The issuing power should be taken from the banks and restored to the people, to whom it properly belongs.” For me that pretty well sums it up, but the crooks are in control – they always have been. As Dante said…and I sure hope he is right… that in hell there is a special place for politicians, add central and money center bankers and the like. The big message is that they stopped buying. The little message is that they’re veering the other way. Hi wolf, is that such a bad thing having a bit of asset price deflation? It’s a good thing for the winners. Asset price inflation crushes the purchasing power of labor (the fruits of your labor) in relationship to assets (housing, rents, buying into retirement plans, etc.). So for people working for a living, and wanting to buy or rent assets with the fruits of their labor, it’s a very bad thing. For people already holding the most assets, it’s a good thing. Any form of inflation has winners and losers. And central banks are picking them. When the assets are repatriated to the investors who purchased them, what are these investors going to do with the funds? More share buybacks? Build Mexico’s wall? How about the government get busy restoring infrastructure? Our infrastructure sure needs some work. Yes P44 was supposed to do that in 2009 onward to put the QE money to Work. For various reasons (Mostly his personal preferences) that didn’t happen. “Monetary policy alone can not relive the Economic issues” Was basically as Publicly pointed as the FED got with its. The administration is not playing its part, position. Post QE III. There was an infrastructure package in the Stimulus Bill for “shovel-ready” projects. I have seen some of this money fund some projects (they put up signs that said this was funded by the stimulus bill). But it wasn’t big enough, and “shovel-ready” projects were hard to come by, and Congress refused to go along with more. And that was a long time ago. Now the infrastructure needs a lot more work, not just roads and bridges, but also rail and other projects. QE caused money velocity to decelerate. QT will cause money velocity to accelerate. Why? Because less savings will be impounded and ensconced within the framework of the payment’s system. The expiration of the FDIC’s unlimited transaction deposit insurance in Dec. 2012 is prima facie evidence (caused the so-called “taper tantrum”). All bank-held savings are lost to both consumption and investment. Why? because, from a system’s accounting perspective (not an individual bank’s experience), commercial banks do not loan out existing deposits, saved or otherwise. The DFIs always create new money, somewhere in the system, every time they buy securities from, or make loans to, the non-bank public. Take the “Marshmallow Test”: (1) banks create new money (macro-economics), and incongruously (2) banks loan out the savings that are placed with them (micro-economics, viz., public enemy #1, the ABA). Stagflation began when the non-banks / thrifts could no longer compete with the commercial banks for loan-funds, in 1966 (exactly like the Fed’s Romulan cloaking device, remunerating IBDDs, which is not supposed to be higher than: “the general level of short-term interest rates” as imposed by the 2006 Financial Services Regulatory Relief Act). The Fed needs to extend duration or banks will be paying 1500 for a MBS with a 1k dollar face ? Something has to give residential last cycle and commercial R.E. this time? Except Mr.R.e. is President! Massive new fresh bailouts and an operation twist to juice markets since taxcut will flop? Fun d mental oval office panic! They’re doing just enough to hold the balance sheet steady because of its size (521 trillion yen) and average duration (7.8 years). From historic low mortgage rates how can it be otherwise. Low rates had a huge influence on the housing market’s rise (this time). And prices are as high generally as they were prior to the housing market crash 10 years ago. How can housing prices go higher as rates rise in this already over priced market? Sell now??? 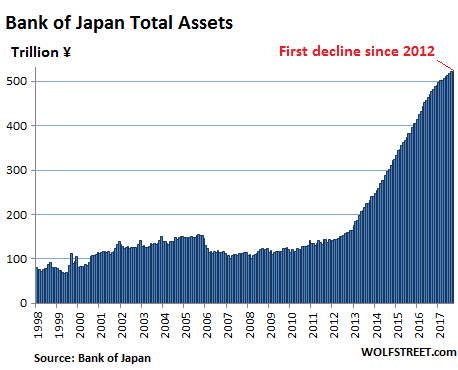 Due to mixed global financial fortunes, it has taken the BOJ, nearly 3 decades to get here. How many to attain some degree of normality in its balance sheet ?? A true analysis of the Modern Global QE experiment. Can not be made. Until at least a decade after all the major CB’S normalise their balance sheets. Them you still have the Highly OPAQUE PBOC as a wild card. There is a brief case with a gold bar waiting at the time machine and all you have to do is go forward, we don’t know how far forward but you can’t come back ! If they ask just say OOPS. They won’t understand. Effective with the release dated January 12, 2018, several changes will be made to the line items shown on the H.8 release. These changes relate to the Federal Reserve Board’s notice published in the Federal Register,82 FR 49207 on October 24, 2017. 2. Current line items 35 and 44, Trading assets and liabilities, respectively, will no longer be published. The amount of trading assets and liabilities will now be reported as part of other assets and liabilities (line items 36 and 43), respectively. I never had a problem with QE. I really don’t have a problem with the Fed buying federal debt during severe downturns. That’s the time when the government needs low cost cash to meet the needs of an unemployed population. However, I have a huge problem with the Fed bailing out bankrupt and corrupt financial institutions. I’d much rather see the Fed step into BOFA, decapitate management, and run it through bankruptcy to wipe out debt instead of adding to it. I’d like to see the Fed actually use its regulatory powers to put an end to fraudulent banking activities. Nobody in power is going to ask my opinion about this anyway, so you nice folks are stuck with the misfortune of reading this. You don’t have a problem with large-scale counterfeiting and debasement of the currency? There will always be people who believe in getting a free lunch. Those who profit from the counterfeiting think it’s just grand. Those that have to earn paychecks to buy stuff are less thrilled – seeing the cost of housing increase 3X in eight years as the counterfeited money floods into the housing (asset) markets. They aren’t stupid. They know the paper wealth could dry up in an instant. The only way they can maintain the wealth is to continue interest rate suppression through their pawns at the Fed and publication of bogus inflation metrics. Housing prices have gone up 200% to 300% in a short time frame and they claim there is no inflation. The Fed claims it is trying to control financial instability, when in reality it is engineering a massive wealth shift to the already wealthy. I beg your pardon, but it’s not a rose garden. You see it is only counterfeiting if you or I do it or any citizen not authorized to do it. It is legal when the duly constituted and government authorized central banks do it. Your government authorized it. If you don’t like it, you can attempt to break off from your country like a spore and, say, row a boat to a remote island or something. Good luck with that. Agreed, debasement of the currency through inflation . is one of the stated goals of the Fed. Why would the Fed get rid of BofA? BofA is probably one of the FED’s owners. The Fed is NOT a government institution. The Fed is not a private bank, no private bank would assume the sort of liability they did, and the Merrill cramdown on BofA, (ILLEGAL to SHAREHOLDERS) would have opened the Fed to a criminal prosecution, as well as civil, but sue the government? Nothing to see here folks, lets move on. The board will continue to shrink! I believe B.S. and Lehman were on the board. (The only alternative is one Fed board member representing the one bank)? you mean Bank of America (BOA)? Fed is owned by big US banks, so BOA is shareholder of FED, how can possibly BOA ( aka FED) bankrupt BOA ? You will see your wishes fulfilled (have no fear) you never really owned anything of value and should always be at peace upon exit? So Yen at 80 soon? Goodbye stock market. That won’t happen. You can predict what the BOJ will do simply by watching the exchange rate. If the Yen strengthens, any unwinding will stop immediately. Considering what a failure Japan’s QQE has been at everything else, currency manipulation is its one success, albeit at a very high price. Since QE is deflationary, the unwind should be inflationary (not asset inflationary … real world prices). At least in theory RE: Japan. 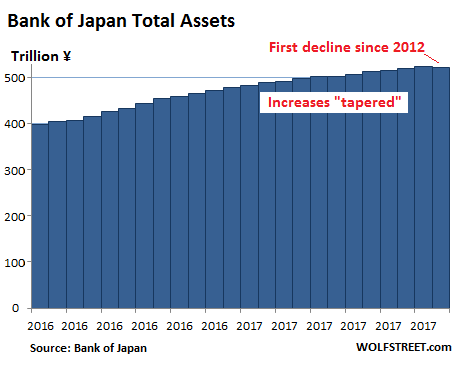 Since the BOJ QE unwind above – the graph with the red dot – looks a lot like a pre-pimple on a full grown elephant’s a**, I think I will be long long gone onto my celestial reward from old age before Japan threatens to think about maybe allowing their economy to not use artificial aids for satisfaction. May get interesting as the Saud’s will soon sell oil to China for yuan, not dollars. The Fed has to unwind to bring in these excess dollars. Is this the real reason? I was beginning to think they were just using QE to get something for nothing and feel smug about it. Acting with the emotional maturity of entitled teenagers who own a printing press. That’s a cool discount of > 1.6% on Japan govt debt. BOJ CAPEX is very profitable. That’s Japanese newest productivity and their new version of six sigma.. Suppose the BOJ used investors money to buy AAPL shares. They govt earn capital gains plus a dividend of $0.63/ Qt, or +1.45%. That’s a fantastic lever. Remember, the BOJ issue debt at negative rates. will soon realize that it’s a shear fantasy. I have to think Japan has a huge retirement problem brewing. How can pensions possibly be funded after so many years of a ZIRP policy? Unfortunately, I haven’t seen any articles about the Japanese retirement situation. The decline is probably due to scarcity of assets to buy. But I have a nagging suspicion that the Japanese replaced the head of central bank with robot. If they can create an, excuse me, life-like comfort doll, it should be a no-brainer to create a central banker. 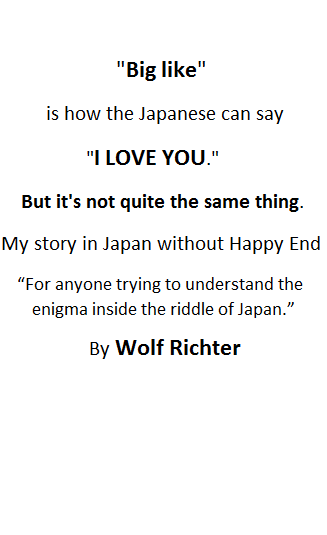 Japan is a huge retirement village with paper obligations, bought and sold by themselves, to themselves, is a white paper for off balance sheet operations which just won’t work in the real world. I think we need to be rational here and take a broad view of all the empirical data, and discern trends. 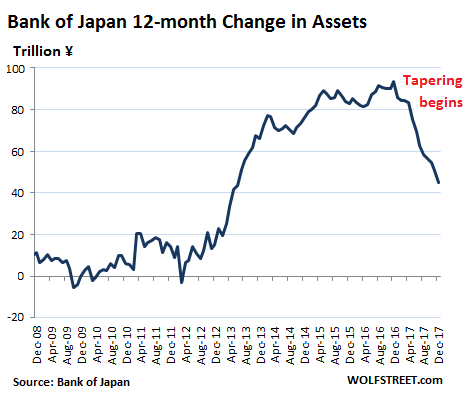 If Japan has QE equal to 96% of GDP and America has 23%, what do you think the Fed will do with it’s “tightening” when Mr. Market has a hissy fit? What will happen if the economy goes into a recession before the unwinding is complete? What tools are left to stimulate an economy? Since WHEN did he ral economy (IE at lower middle class and lower class levels) leave recession and income/Spending power Deflation/Erosion. The numbers that say the economy is improving are held up by massive asset bubbles not REAL economic productive activity for the masses. The proof of this, WAGES ARE NOT RISING, they are in fact (when you factor in reduced spending power and increased costs) still effectively shrinking. The unwinding if done successfully may force those that have to find some real work for their capital which benefits everybody and completes the cycle, as opposed to locking it into paper asset inflation bubbles which benefit only them, to the detriment of the rest. Complaining that those that have are locking their money into tax havens is simply ENVEY its theirs they can do what they wish with it. There is a simply law of wealth, that the envious complainers deny. If wealth people do not work at staying wealthy, they don’t stay wealthy, for long. Like everybody else, if the wealth isnt growing, its shrinking. In Japan, the US, and elsewhere, the income and wealth inequality caused deflation as wealth shifted from middle class (who are primarily spenders) to the wealthy (who are primarily savers). QE offsetted this deflation by increasing the base money supply and reducing interest rates. To date, the deflationary effects of wealth and income inequality offset the inflationary effects of money printing, interest rate reductions, and fiscal deficits. This tells us the deflationary impact of wealth inequality is MASSIVE. It takes massive deficits, money printing, and ZIRP to offset that deflation. But behind the facade inflation is occurring. Many household products and food products show reduced sizes. Many of the clothes today not made of cotton or wool, but synthetics which are not durable. The CPI data is all about price, not quality. We are being lead to believe inflation is low. But keeping prices down easy if quality and sizes are decreasing. When I bought my wife’s ring in 1973 gold was $90 oz. When I bought some gold coins in 2006, gold was about $550 oz. Gold now is $1300 oz. Gold has increased about 10% yearly. ZIRP was to force all to the stock market where inflation is booming. I simply do not believe much of what is being preached today when it comes to value, prices, investing. The real up-shot of this article is…..that GROWTH HAS RETURNED. After all, central bankers are logical eminent people. They deal in causality and reality. So now, growth is sustainable? Well, this is SO fake! A look at the past 5 years for Nikkei 225 shows a 115% growth for Nikkei, and 105% for Topix, but they actually peaked on Aug 2015 and fell big….so what’s different NOW? It’s really coordination with US for currency purposes. And, what of the US? S&P500 shows a 83% return over last 5 years. With LOW VOLATILITY…rather smoothly UP. So why has growth come NOW and not say…..6 mos ago? One big joke all over the world, these central bankers are. It’s NOT A SCIENCE. ITs complicit with OTHER THINGS. Yes. Actually, I’ve been a contributor on ZH since about 2012. Sometimes I post them myself, in which case they appear at the top ribbon that goes across the page and usually holds 3 or 4 headlines; or they post it, in which case the article appears in the main section, which is what they did with this article. I’m also a contributor on Business Insider (since 2011), Seeking Alpha, HuffPo Canada (though I have posted only a couple), Naked Capitalism, and a couple of others. My stuff fairly often gets cited and parts of it reprinted (with my permission) on MarketWatch, occasionally in Barron’s, and a few others. My stuff gets translated into foreign media quite a bit, and I find out about it when someone sends me the link or an image of the paper-paper (which I love… so quaint to see my name in print on paper). However, many other sites steal my content without permission, so I’m always thankful when readers point out where they have seen my stuff. So thank you!! Thanks, @ fused we use the author, title & description from your RSS feed, but never the whole article. Wolfstreet articles are included in the overall search results and in the Independent news filter.